I have a hard time with stuff. Or more specifically, I have a hard time parting with it. My father was notorious for tucking away orphaned screws, bolts and tire weights in empty coffee cans and yogurt tubs "just in case," and it is safe to say I have inherited his inability to purge. Although "collecting" has been part of my life for as long as I can remember, I never struggled with it as much as I did becoming a mother. Suddenly, everything had intense meaning - the onesies the boys wore as babies, the board books they had long ago outgrown and the rattles discarded in a basket at the bottom of a bookcase were all dripping with sentimentality. At the same time, I have experienced firsthand the stress that comes with having more. A small house with two adults, two boys and two cats doesn't leave a lot of room for unnecessary extras. Pushed largely by my husband (who actually asserted that the attic would fall in if I put one more tub of outgrown baby clothes up there), I bit the bullet and decided it was time to part with a few things. I opted to consign our baby items with a local children's consignment event, Just Between Friends. But I knew I wouldn't be able to price each piece myself. 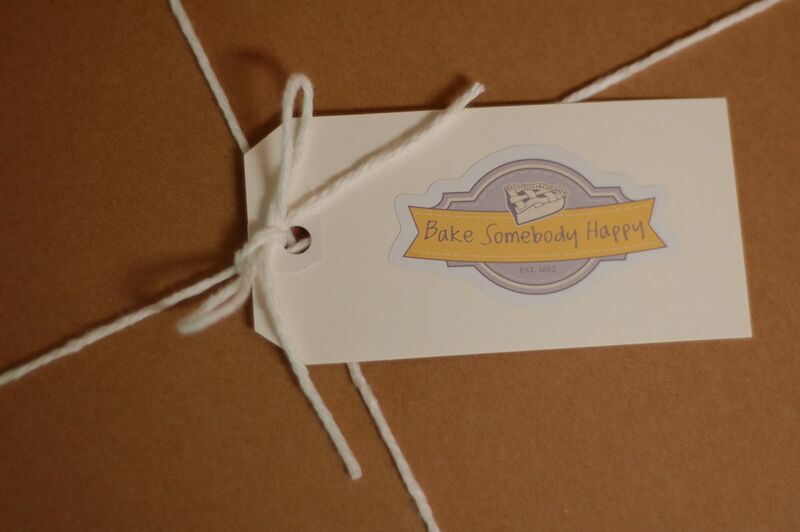 First off, I had approximately 300 clothing items boxed up and ready to head out on the next leg of their journey. Secondly, that sleeper that kept my precious winter babies warm all night - the one with the sweet yellow ducks on the front - well, it was worth more like $4 than the priceless value it had to me. So, I signed up online to have my items priced by a third party - a valet tagger - all the while secretly hoping that there wouldn't be anyone available and I would just have to keep all that stuff a little while longer. Then came the call - from a lovely lady named Cassandra. As I fed my kiddos their lunch that afternoon, I spilled my guts out to a woman I had never before met. I told her how difficult it was for me to part with these things. I told her how, honestly, I just wanted to cry at the very thought of parting with anything. And I told her how badly I wished for a third baby - and that maybe that meant I should just keep it all. Cassandra listened and validated and empathized with my struggle...and I felt strangely safe handing my items over to her. So, several weeks later we loaded the truck to the brim with boxes and bags of clothing, books, toys and baby equipment and drove the whole lot to Cassandra's house. On the ride there, tears filled my eyes and a lump formed in my throat as I began to second guess this crazy venture. It was starting to feel a little too much like saying goodbye to my babies for my liking. But, when I met Cassandra face to face in her driveway that day, I knew my things were safe. I recognized that God had put her in my life for a reason - that out of all the taggers and all the sellers, we were divinely paired together. She told me she would take good care of all of those things that held so many memories for me and I trusted her. I hugged her goodbye and drove down the hill from her house, sentimental but also keenly aware that I could breathe better under the weight of less stuff. Over the next few weeks, Cassandra reached out to reassure me several times. In one particular email, she wrote, "I know this was hard for you to choose to sell these items. I prayed for you this morning and God put it on my heart to tell you that sometimes He may ask you to give up something in order to give you an even greater blessing later. Thank you for trusting me with your items. They will be well cared for as I continue tagging." Cassandra has been such a blessing in my life. She has prayed for me and helped me find peace when I felt so unsettled. She has shared scripture with me when I have struggled. I have been uplifted and renewed by her Biblical knowledge and willingness to lovingly speak truth into my life countless times. I so admire the woman of God that she is and strive to be more like her to those He places in my life. Since that first meeting, I have sold items with Cassandra several times, and although I still find it difficult to separate the thing from the memory, it has gotten a wee bit easier every time. I have made a small amount of money and freed up that space in the attic. But, most importantly, I have made a friend. 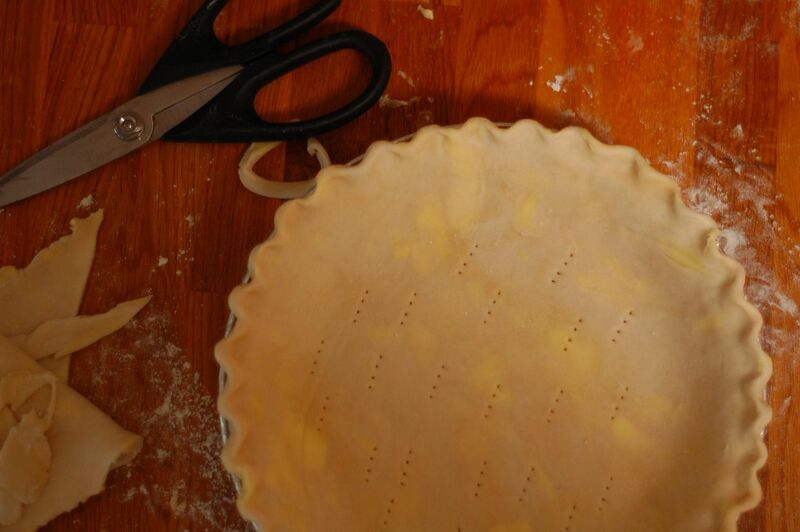 And if that isn't pie worthy, then I don't know what is. 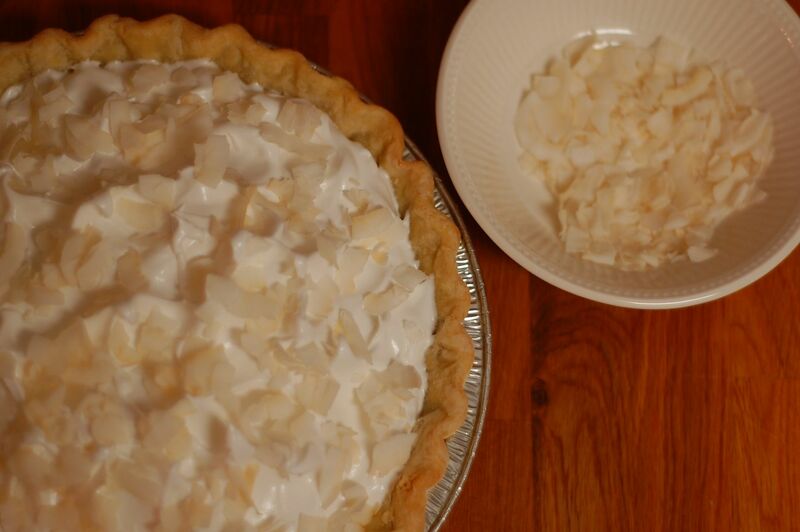 When I began dreaming up the perfect pie for Cassandra, I found myself returning over and over to the idea of coconut cream. 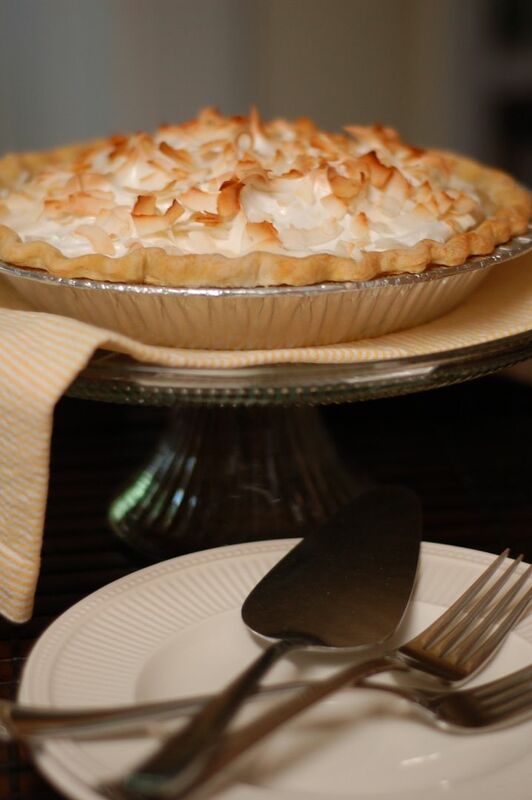 Largely, I think, because I had not yet made my own version of this classic pie and also because there is just something about coconut layered with meringue that connotes summertime and fresh starts. 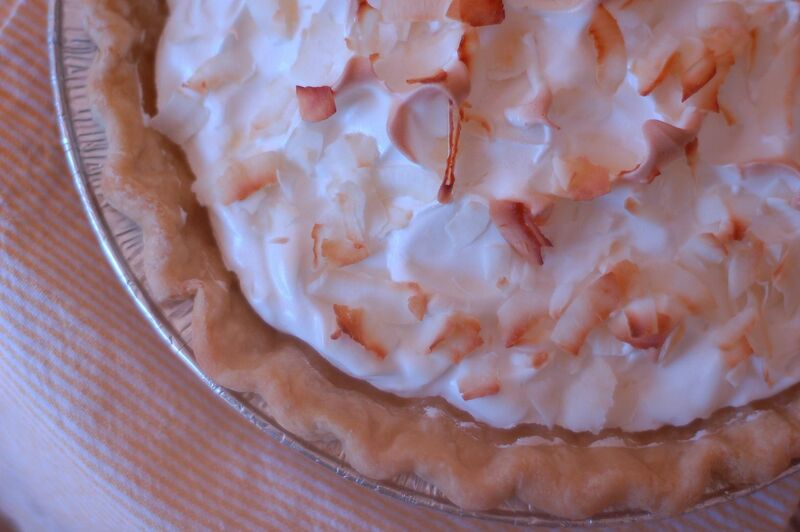 So, I set out to create Cassandra's "Just Between Friends" Coconut Cream Pie. 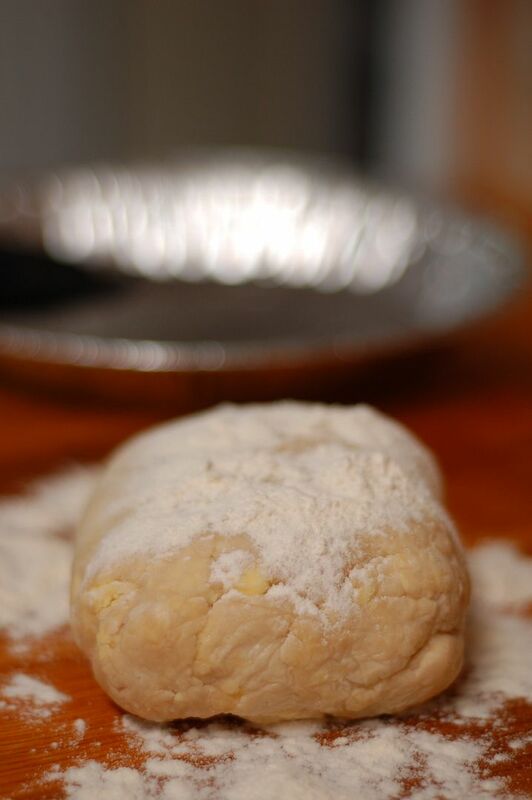 I began with my tried and true pie crust recipe, cutting equal parts butter and shortening into a bowlful of chilled flour and salt before adding iced water to combine. 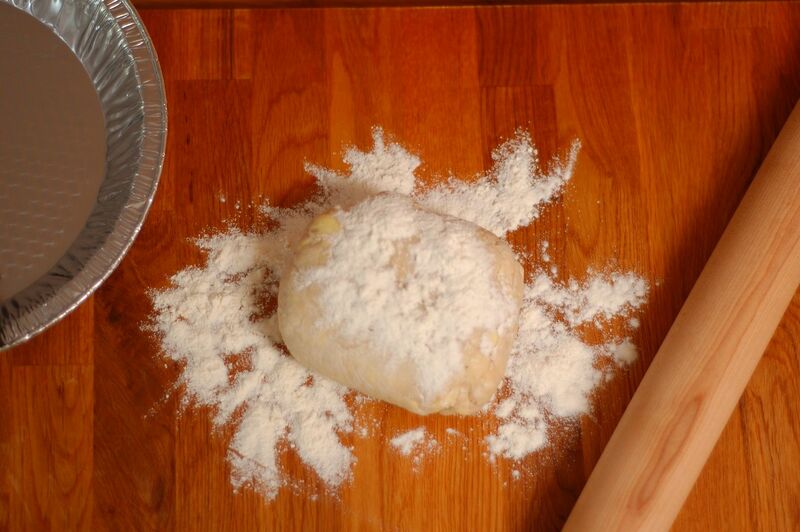 After the dough had chilled, I liberally floured down my butcher block, rolled the disk into a uniform sheet of pastry and transferred it into the tin with the aid of my rolling pin. I then trimmed and crimped my way around the perimeter. While the chilled crust baked under a layer of parchment paper and dried beans, I gathered the ingredients for the filling - coconut milk, whole milk, granulated sugar and salt. As the milk mixture simmered on the stovetop, I whisked together several egg yolks, cornstarch and additional sugar in a separate bowl. 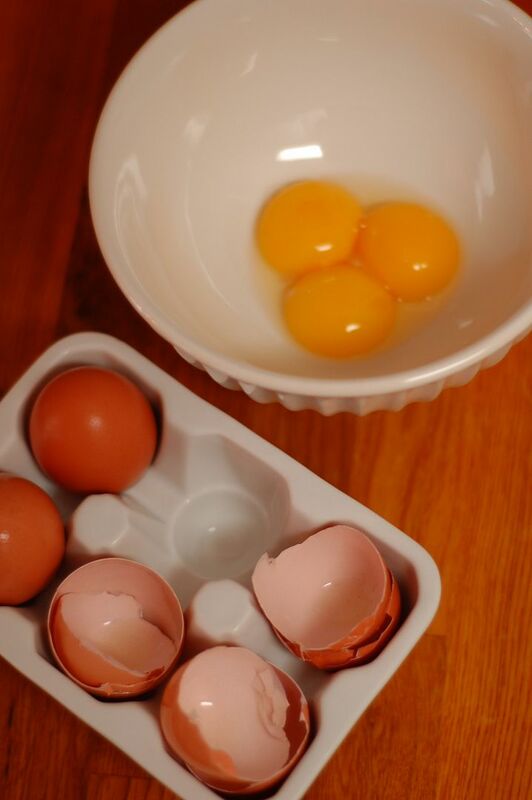 I tempered the yolks with the warm milk to avoid scrambling and added them to the saucepan, stirring until bubbles formed and the custard had thickened into a pudding-like consistency. 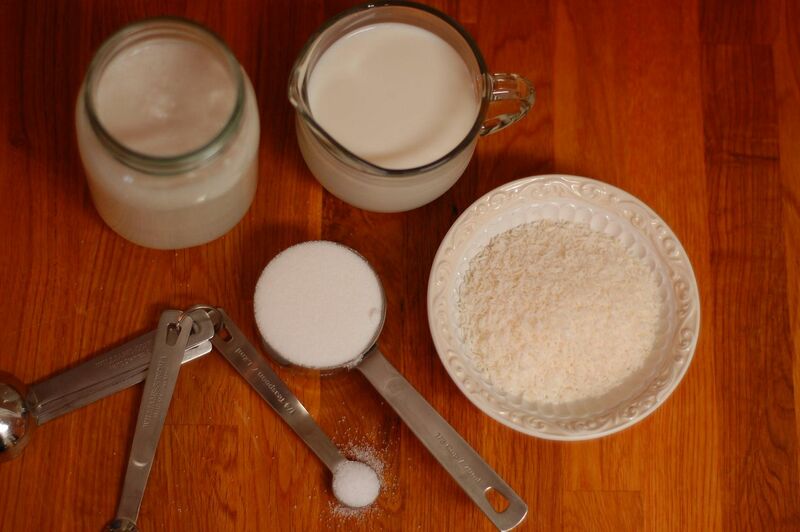 I removed the custard from the heat and added a couple of pats of butter, a dash each of vanilla and coconut extracts and a hefty handful of unsweetened shredded coconut. 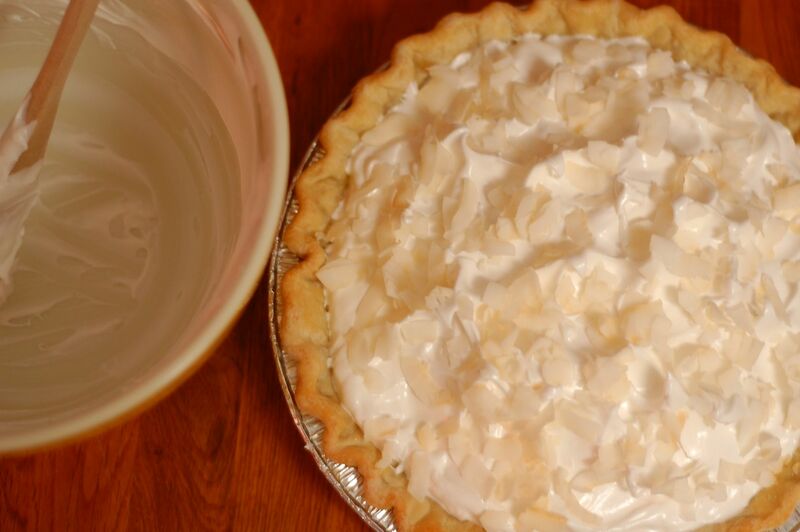 Once cooled, I poured the coconut cream filling into the blind-baked crust and placed the pie into the refrigerator to chill until firm. Finally for the meringue - that airy, sticky, glossy cloud on top that is the crowning glory of this pie. 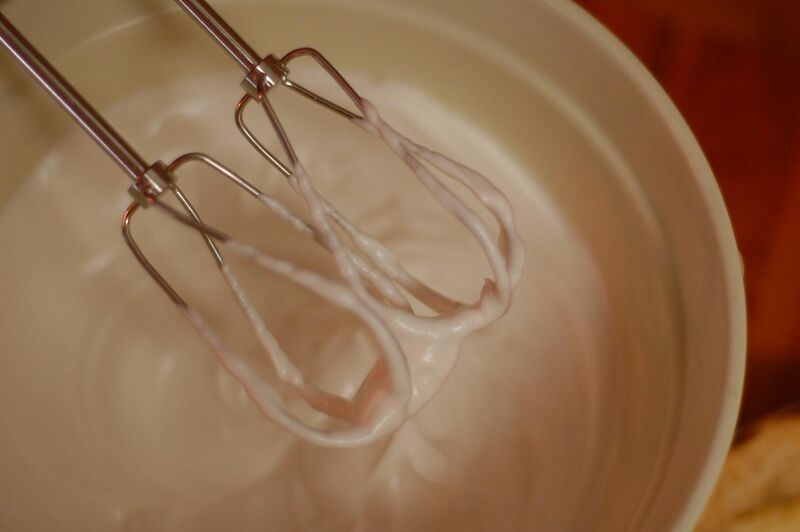 Using my handheld mixer, I beat together egg whites, cream of tartar and vanilla extract before gradually adding in the granulated sugar, a spoonful at a time, until stiff peaks formed. 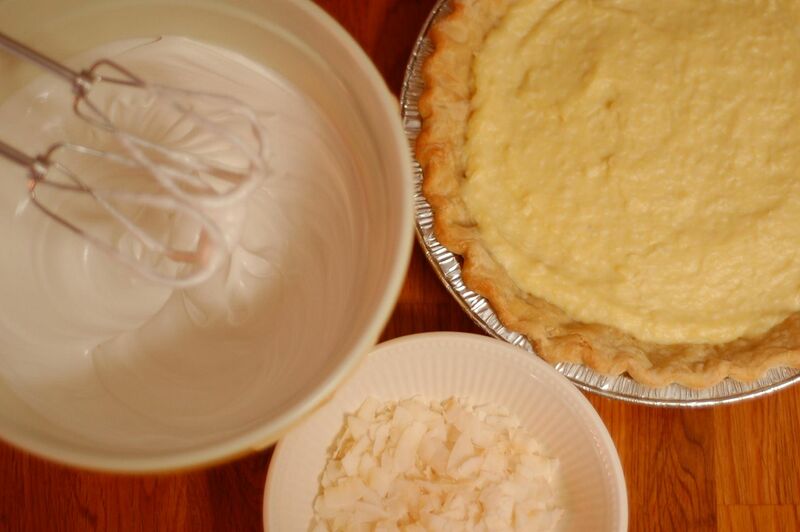 I spooned the meringue over top of the custard, using the back of the wooden spoon to create a series of random peaks, before dousing the entire pie with a generous amount of unsweetened coconut flakes. Then, into the oven...just until slightly golden and toasty. I readily admit that change and letting go are not my strong suits. Yet, I have found time and time again that taking that first uncertain step often results in unexpected riches. When Cassandra sent that beautiful reminder my way that "sometimes He may ask you to give up something in order to give you an even greater blessing later," maybe, just maybe, she was hinting at the blessing of a new friendship as well. And for friendship and pie, I will always make room. Erin, you did a great job here explaining how we all feel about our precious baby items. Loved every word. I am going to post on the JBF Fan page your blog. Thank you so much for the kind words about our very special Cassandra. 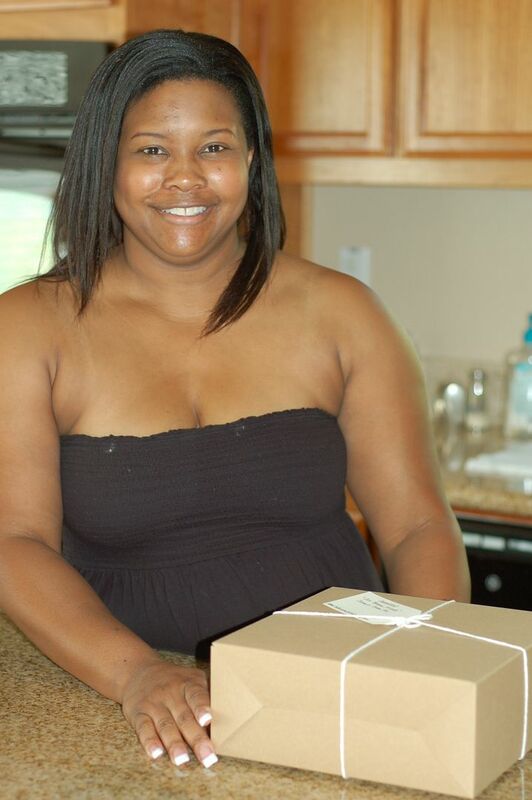 JBF owners across the nation are reading your blog now. Much success to you! Oh, that is exactly how letting go of these special items is like for all of us. But, rest assured, those items are someone else's special treasures now getting MUCH better use than sitting in your attic! It is hard to let go, but it's also so freeing once we do! Very well written and thanks for sharing. Thank you Erin for your post about how hard it is to let go of our kids' items. I too had this same difficulty and it also brought me to Just Between Friends here in Washington and has made a HUGE change in my life as well. What a blessing of friendship and shared experiences it really does bring into our lives! All the best to you! Wow, you put into words, exactly how we feel, as mamas, letting go of items that hold our precious memories! I love this post. How wonderful, that Just Between Friends recognizes just how difficult it is for mamas to turn these items over and entrust them to someone else! I've just sat here and read several of your posts. What a beautiful person you are. Thank you for sharing.